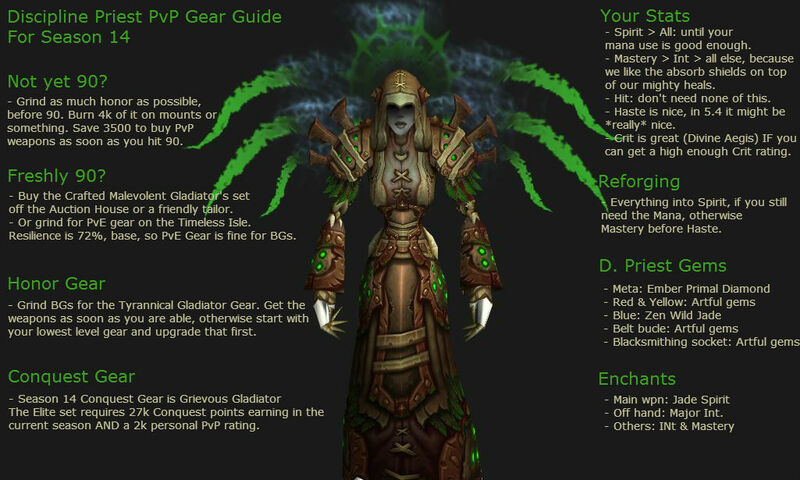 Gearing your Discipline Priest (or any class) properly is essential to a better PvP experience. If you hope into the BGs (or, ack, arenas) in your item level 400ish greens, well, it’ll be tough. It’s not like dungeons or raids or heroics, where you need a certain minimum item level. Nope, you get to hope in with whatever you got. If you’re already 90 you’ll have to work a bit harder. At 90: You can either buy the Crafted Malevolent gear set, if you have lots of gold, or poke around the Timeless Isle for a couple hours, opening chests, and collecting your 496 PvE gear. Since everyone, regardless of gear, has 72% Resilience (as of patch 5.4) the PvE gear will be fine for honor grinding in the BGs. If you get both PvP trinkets you get an additional 10% Resilience. Getting better PvP gear: PvE gear is downrated in the PvP settings (BGs, arenas, etc.) so the PvP gear is better. Yes, your ilevel 560 PvE gear is downrated to 496 or so. Grind up the points for the Tyrannical Honor gear. Spirit before anything else, until you’re “Ok” with your mana use. Mastery for the absorb shields on top of the heals. Int for more powerful everything. Crit is arguable. Some pan it, some love it (Divine Aegis effect.) Of course, you have to be able to get enough crit rating to make that worthwhile…. Reforge to Spirit, if you need the mana, Mastery before Haste for the rest. Zen Wild Jade if you’re matching socket colors, Artful Vermilion Onyx if you’re not. Go for Spirit, if you still need more, otherwise Int and Mastery. There are no head enchants, so ignore that part.